Whether you are working with HFR 4K/UltraHD, 2K/HD, SD, Deep Color and/or HDR, experience the quality and peace of mind that KONA 5 brings to your world. Supporting 10-bit 4:2:2 and 4:4:4, or even 12-bit* color spaces for pristine imagery, KONA 5 allows the flexibility to ingest and output with 12G/6G/3G-SDI and monitor with a full-size HDMI 2.0 port. 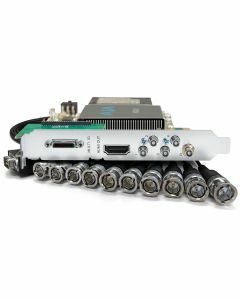 The bidirectional 12G-SDI ports provide immense flexibility for capture and simultaneous pass through, and with the appropriate software, multi-channel capture and streaming.